Stephen Roche loses the pink jersey to his Carrera team-mate Roberto Visentini ? but then gained it back in sensational circumstances, amid accusations he attacked his own rider in the mountains. 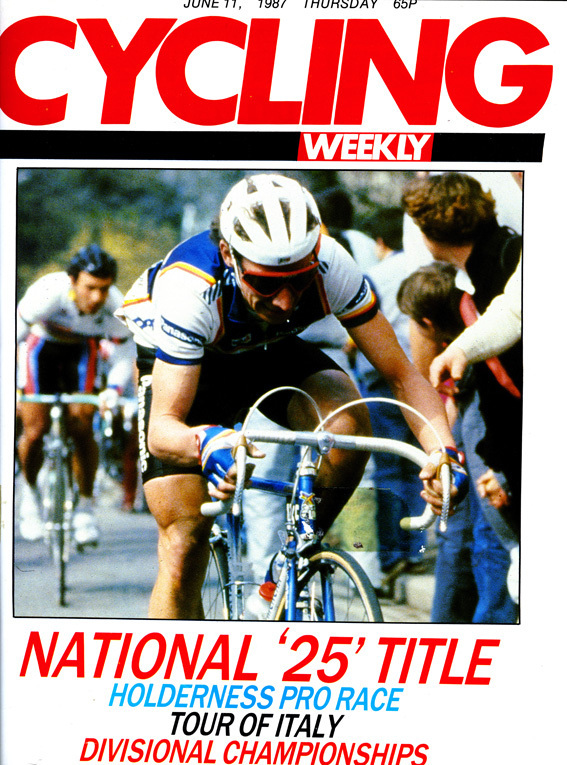 Here we look back at how Cycling Weekly covered week two of the 1987 Giro d’Italia. Italy?s Paolo Rosolo (Gewiss) triumphed after a massive crash decimated the field in the last few hundred metres. Among the victims were Giuseppe Saronni, Guido Bontempi, Mathieu Hermans, Ezio Moroni, Enrico Pochini, and Stephen Roche. Saronni was badly cut while Hermans fractured his collarbone. The rest were suffering from cuts and bruises. The accident occurred as the Atala team were trying to get a good position in the last kilometre for Urs Freuler. The roads were wet and as the pace increased Hermans and Bontempi collided as they switched to avoid Giuseppe Calcaterra, who had slipped on an oil patch. Bontempi and Hermans fell in the middle of the road and provoked the crash. Race leader Roche who had sat up to avoid the risks in the gallop to the line, was knocked to the ground as riders behind him reached the pile-up. ?I never take part in the sprints, they are too dangerous,? said Roche. ? I saw the crash and put my brakes on and stopped before I hit anyone, but those behind me did not and rode into me, I had a few cuts on my legs, nothing serious, after a good night?s sleep I hope to be alright,? he added. Stage winner Rosola avoided the crash. ?I heard the noise of bikes falling, but as I was at the front I was not worried. I would have preferred to have won in different circumstances although it is all part of the race,? he said. France?s Robert Forest (Fagor) won the stage and Roberto Visentini (Carrera) moved nearer to Steven Roche in the overall table. It was Visentini?s 30th birthday and he was in good form, taking seven seconds out of Roche. ?I had my worst day of the race,? said Roche. He had not recovered from the previous day?s crash and when 50 riders had come down and he was unable to hang on to the leaders on the day?s big climb, the Valico Sasso Tetto. Roche led at the start of the climb before Visentini took the front. At the top of the mountain Roberto Conti was first over the line followed by Robert Millar, Mario Lejaretta and Visentini. Roche was 17 seconds further back. The Irishman managed to close the gap, as did Giuseppe Saronni. With 77 kilometres to go Paolo Cimini attacked. He was joined by seven others including Pascal Jules, Robert Forest, and Lars Wahlqvist. They went five minutes clear only to lose most of their advantage in the last hilly kilometres. On the stiff climb to the finish Forest put in three attacks before going away on his own to cross the line 12 seconds before Romano Randi. Roche lost contact with Visentini and world champion Moreno Argentin on the last climb, suffering from his injuries and unable to push his big gears. ?The crash must have done more damage than I had thought at first. My left leg is giving me trouble and I am unable to use big gears,? Roche said. ?The future does not look good, especially with the time trial at San Marino to come.? Guido Bontempi took revenge on all his critics when he won at Bellaria. He won five stages in last year?s Giro and so far this year he had not been able to win one. ?I dedicate this win to all those who denigrated me after the crash at Termoli [many blamed him for the accident] and I wanted to show that I can still go fast,? Bontempi said. It was Bontempi?s 11th Giro stage win and he beat Adriano Baffi, Paolo Rosola, Flavio Chesini, Urs Freuler and Eddy Planckaert. Race leaders Roche and Visentini had a quiet day preparing for the next day?s time trial from Rimini to San Marino. Roche?s injuries were a little better while Visentini seemed to be coming to peak form. ?The victory of Bontempi, today proved that he is still fast,? said Carrera team boss Davide Boifava. ?All the team worked well today.? Roche explained that he was still having trouble getting his big gears swinging. ?I am taking anti infection tablets and they are affecting my stomach a little. With massage and other treatment for my injuries, I hope everything goes well in tomorrow?s time trial,? Roche said. Roberto Visentini took the pink jersey of race leader from Stephen Roche on this crucial stage of the race. Visentini, winner of last year?s Giro, outclassed all his rivals on the stage to win by 1-11 from Switzerland?s Toni Rominger and Lech Piasecki, who was at 1-20. Roche finished at 2-47, five seconds faster than Britain?s Robert Millar. Visentini was soon into his stride, 10 seconds faster than Roche after 14 kilometres, 32 seconds faster at 25 kilometres and 1-10 at 38 kilometres, on the route made up of three climbs split by long drags. None of the true climbers figured in the first four places, while the other stars fell even further back. ?I really wanted to win this stage,? Visentini said. ?The rain did not help but the conditions were the same for everyone. The Giro is not over yet. In fact I would say it has just started today. We still have some terrible mountain stages. On a bad day it will be possible to lose 10 minutes, the winner will not be known until the last day at St Vincent,? he added. A dejected Roche had suffered badly, troubled by bruises on his buttocks, the result of the crash at Termoli. ?It was terrible on the climbs, but I have not given up,? he said. ?There is another week to go yet. Now it is up to Visentini to take on the responsibility as race leader. There is no question of my packing,? Roche said. Paolo Cimini scored the first win of his professional career at the end of the longest stage of the Giro. Cimini, 23, rides for the Remac team courtesy of his father who is one of the co-sponsors. Before his Giro success his best result was a second place on a stage of Tirreno-Adriatico. But Cimini grabbed the glory with prolific winner Rosola inches behind in second place. Visentini and Roche finished in the bunch content to wait for the next day?s hilly route through the Dolomites. Roberto Visentini was destined to wear the pink jersey for just one day. He blew up in a big way on the final climbs to the hill-top finish at Sappada, losing 6-50 on stage winner Johan Van Der Velde ( Gis). More importantly he lost 3-12 on Stephen Roche who regained the overall lead while Visentini slumped to seventh overall. Roche had shown his intentions by figuring in two breakaway moves, the second being pulled back with 17KM to go. In the closing kilometres a 14-man group went clear, including Robert Millar (Panasonic) who was to finish fourth and to move to fourth place overall. Roche and Canada?s Steve Bauer (Toshiba) were also with the leaders, while behind them Visentini painfully zig-zagged up the climb helped by the pushes of innumerable spectators. Switzerland?s Tony Rominger (Brianzoli) finished second on the stage and moved to second overall, just five seconds down on Roche!